It's a Miata thing...you may not understand. Even if you aren’t a gearhead, chances are that you’ve heard the phrase, “It’s a Jeep thing…you wouldn’t understand,” at least once before. I obviously don’t understand because to me Jeeps are awesome, and the allure of the Wrangler seems to be universal and not mysterious whatsoever. What can be hard for someone to get is why the Mazda MX-5 has such a rabid following. 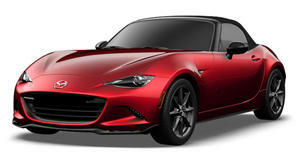 “It’s a Miata thing…you wouldn’t understand,” now that’s a perfectly apt tagline for the iconic Japanese roadster. I didn’t completely understand the Mazda thing until I drove the 2016 MX-5 Grand Touring for a week. To be fair, the hype surrounding the car wasn’t some big mystery to me. But there’s a powerful difference between reading about a feeling and experiencing it firsthand. (Duh.) Yes, I had a pretty good idea as to what my second time behind the wheel of an MX-5 would be like; I had driven a ’90 MX-5 for a weekend many moons ago. That being said I was still surprised at how accurate all the platitudes affixed to the 2016 Miata were. These are the five things that everyone says after driving the new MX-5. The great thing about the 2016 MX-5 is that it feels instantly familiar. There’s no lengthy learning curve where you feel the car out to see what it can and can’t do/what you should and shouldn’t do. It's all so intuitive and natural. The 40 mm shift stroke combined with the engine’s love of quickly climbing through the rev range will have you rapidly running through the gears. Around the bends the MX-5 stays rigid and firmly rooted to the ground. It takes some effort to get the rear tires to give out. While I knew the suspension and chassis would excel through twists and turns I didn't expect the car to behave so civil when I took it out in the city. Despite sitting a foot off the ground the ride is surprisingly smooth. The steering is electric and not hydraulic like MX-5s past but it won’t kill you with a lack of feedback. Take that with a grain of salt as I don't have an extensive history with the Miata but I doubt anyone but diehards will consider the lack of hydraulic steering a deal-breaker. What else is awesome here...well, the clutch is just about the perfect weight. The driving position is ideal, although I would have liked racier bolsters. Everyone who has driven the 2016 MX-5 knows that its naturally aspirated 2.0-liter four-cylinder engine provides the perfect amount of punch. You don’t really need much more than 155 hp and 148 lb-ft of torque when you’re motivating a car that weighs 2,332 pounds. And while those power figures seem small on paper the 2016 MX-5 needs just 5.8 seconds to go from 0-60 mph. That's not too shabby at all. According to Car and Driver it's actually better than the 0-60 time posted by the turbocharged (and heavier) Fiat 124 Spider Abarth. Mazda isn't interested in adding a turbo to the MX-5 but does seem keen on the idea of cutting more weight. Less really is more here. You’d expect an engine as small as the MX-5’s to sip gas, but I was surprised at just how well it did. You’ll very often approach the red line even on short trips around town, which should massacre your mileage in theory. But even with all of that torture the engine returns admirable fuel economy. The official split is 27/34/30 and I was able to manage in the high 30s on some highway drives. Your mpg figures will drop precipitously once you let the little engine roar but even under duress Mazda’s SkyActiv mill never returned worse than a 25 mpg average (highway + maniacal mountain road driving). 4. But what's the Club like? The MX-5 Club is the enthusiast's choice and is the middle child in terms of pricing with an MSRP of $28,600. It's the enthusiast’s choice thanks to its trim-specific and manual transmission-only goodies like a limited-slip differential, Bilstein shocks and tower brace. All models, even the automatic, get 17-inch alloy wheels and a front air dam and rear spoilers. There’s also a package that offers forged 17-inch BBS wheels and Brembo front brakes. My Grand Touring tester stickered at $31,330 and I have to say that I could have lived without the heated seats. The Club isn’t entirely devoid of creature comforts as it offers a 7-inch touchscreen and nine-speaker audio system (same as in the Grand Touring). My recommendation is to live a little and check out the Club model. That being said if you need to pinch pennies the entry-level Sport trim checks in at $24,915. You lose the touchscreen, heated seats and a bunch of other cool stuff but in a car like this that doesn't really matter. If you're going to spend extra money put it towards performance. 5. It doesn't look like a "girl's car"
I refuse to believe that I'm the only person who thinks this. Now I’ll admit that the first-gen NA Miata looks like something you would find parked in front of Barbie and Ken’s dream house, but the current ND model looks anything but soft. Two powerful lines flare up from opposite sides of the hood and run the length of the car, giving it a hard look up front that gently flows into the minimalist rear end. All Miatas have had goofy looking front ends and the ND carries on that tradition to a point. But overall the car looks sharp and less cutesy than ever before. It's not quite "badass" but it'll manage to turn some heads for the right reasons.